Front and Rear 1000W Hub Motor Kits with PANASONIC 48V 17.5Ah Tiger Shark Battery. These kits are the ultimate solution for people who want high power and top range. These two commodities rarely are available in the same kit. The new PANASONIC 3500mAh in the tidy larger Tiger Shark battery mould allow this extremely high capacity battery to fit within the frame of many bikes. The battery is one of the strongest on the market if you need to run high power applications. 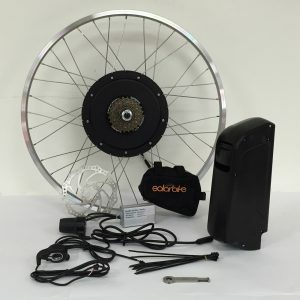 This model battery can be successfully used with motor powers of up to 2 Kilo Watts as it’s had the circuitry, fuses and wires all specifically designed for high power electric bikes. 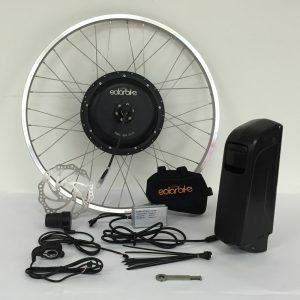 The kits are available for front and rear wheels in rim sizes of 26″ and 700c. Keep in mind that 200W is the legal limit for riding on the road.